Eighty industrialists, including big corporate groups such as Birla, Reliance and Adani, are also expected to attend the ceremony alongside the Prime Minister. LUCKNOW: Prime Minister Narendra Modi will, on July 29, inaugurate and attend ground-breaking ceremony of projects worth Rs 60,000 crore in presence of top industrialists of the country. This will be the fifth visit of the PM in Uttar Pradesh during the past one month. However, this would be the first time that the PM will be visiting Lucknow on consecutive days on July 28 and 29 to attend separate programmes. The Yogi Adityanath government will be holding a mega ground-breaking ceremony for launch of around 74 projects here on July 29. Modi is also scheduled to attend the concluding day session of another Smart City conference being organised here by the Union urban development ministry on July 27 and 28. Eighty industrialists, including big corporate groups such as Birla, Reliance and Adani, are also expected to attend the ceremony alongside the Prime Minister, Industry Minister Satish Mahana said here on Wednesday. Baba Ramdev, whose Patanjali group is in the process of setting up a food park in NOIDA, is also expected to attend the event besides the representatives of Paytm, Gail, HPCL, TCS, ACC cement, Metro Cash and Carry, PTC Industries, Goldie Masala, DCM and Sriram group. According to political analysts, the event is being organised to give an `image makeover' of the state" ahead of next year's general elections. With only a few days to go for the event, the city streets are being decked up with colourful lights. The footpaths and road dividers are getting a fresh coat of paint and teams of sweepers have been deployed to clean the nook and corner of the city. IT experts are making preparations to telecast the events live across the state. The districts magistrates have also been asked to review the preparations in their respective districts, where the events would be telecast live. The Prime Minister, who will arrive here on July 28 evening, will inaugurate 57 projects under Atal Mission for Rejuvenation and Urban Transformation (AMRUT) scheme, 26 projects under Smart City scheme and 11 projects under Pradhan Mantri Awas Yojna (Urban). While keys to the respective houses would be handed over to the beneficiaries at the event, Modi is also scheduled to interact live with some of them through video-conferencing. The next day, Mr Modi is scheduled to attend the ground-breaking ceremony of projects worth Rs 60,000 crore. "When the Prime Minister will lay one brick here in Lucknow, the groundbreaking for the projects would be done digitally in the districts concerned," said Satish Mahana. Close on the heels of 'Investors Summit' held in February this year, the ground breaking ceremony for the mega projects with the potentials of creating over two lakh new jobs would be held at the Indira Gandhi Prathisthan in the state capital. Chief Minister Yogi Adityanath, who led the state in holding the successful investors summit earlier this year, held a meeting to review preparations and issued instructions to all those concerned to make preparations for the function. 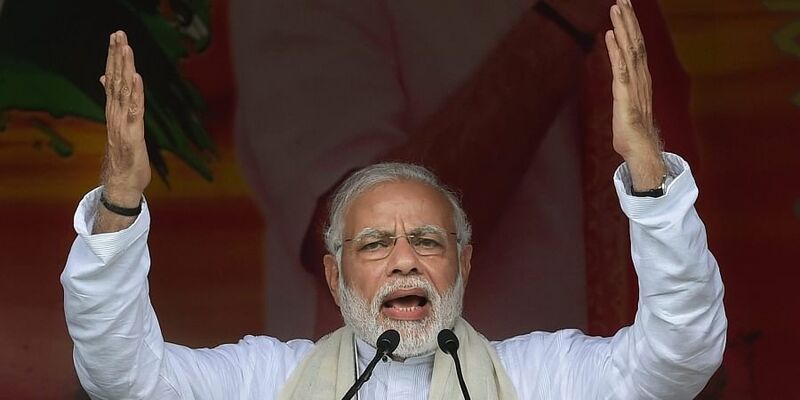 The opposition parties, however, have chosen the opportunity to mock at the Prime Minister's frequent visits to Uttar Pradesh dubbing it as an indication of "the BJP's nervousness" before the 2019 Lok Sabha elections. SP spokesman Rajendra Chaudhary said that the PM has come to realise the anger among the people and it is evident by the frequency of his visits to the state and his speeches. Congress MLC and leader of of the council Deepak Singh said that PM and other BJP leaders know their fate in UP during the 2019 polls hence they are trying to confuse the people through their fake announcements and programmes. Rashtriya Lok Dal spokesman Anil Dubey said the BJP knew how it has befooled people with its "jhoote vade" (false promises) and feared that Uttar Pradesh, which played an important role in its victory in 2014 might go against it. Accordingly, the BJP has resorted to more lies through such events, he added.